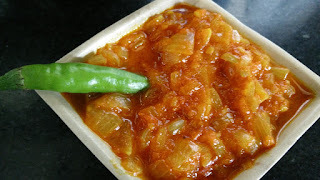 This chutney is very easy to make. It can be served along with any snack, or use it a spread on pizza base, bread slices or have it in any form, it will taste delicious. Little Sweet, Little Sour!!! 1. Heat oil in a kadai. Add chopped ginger garlic and green chillies. Add onions and add all spices and sauté for 5 min. 2. Once onions are little cooked, add tomato puree and cook for 10-15 min on medium flame. 3. Add sugar and cook for another 2-3 min. 4. Serve at room temperature as per the use.